IDCORE & IES Researchers had a fantastic week of visiting renewable energy sites, learning more about the renewable energy industry work and getting to know their colleagues from across the cohorts. On Monday 17th March the first year students visited the Whitelee onshore wind farm – the UK's largest onshore windfarm, located on Eaglesham Moor just 20 minutes from central Glasgow. Its 215 turbines generate up to 539 megawatts of electricity, enough to power just under 300,000 homes. On Tuesday 18th March all three IDCORE cohorts were joined by several PhD researchers from the Institute of Energy Systems for a visit to the National Renewable Energy Centre in Blyth, near Newcastle. The site visit gave the students the opportunity to see the unique full-scale testing facilities at Narec including the 15MW wind turbine drive train test facility, the 100m blade test facility, and the 10MW tidal turbine drive train test. The visit demonstrated the importance facilities like this can play in growth of the offshore renewables sector. On Wednesday the group of 28 Researchers left Edinburgh for a trip to the Orkney Islands – the heart of renewable energy in Scotland. Over two full days, the students were able to get up close and personal to the wave and tidal devices that envelope their research. There were some extremely interesting talks and tours from European Marine Energy Centre (EMEC), Aquamarine Power and Pelamis Wave Power. 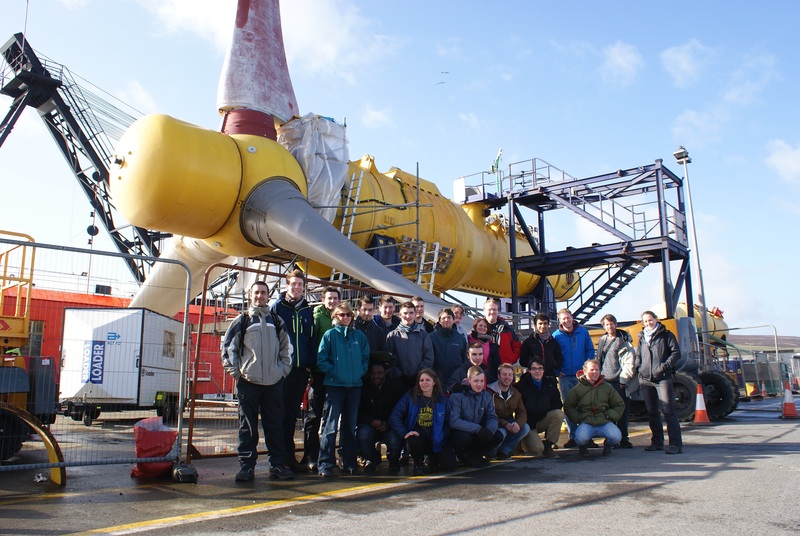 Researchers were given an insight into the work of the leading developers in wave energy and found out a lot about operation and installation of the devices. There was also time for the students to visit several tourist sites, including the famous 5000 year-old settlement, Skara Brae. With all the researchers integrating nicely throughout the trip, the third IDCORE cohort was given some idea of what they have to look forward to when starting their company-led research projects in June. The trips were an amazing opportunity to see renewable energy in action - an inspirational experience for future technical officers in offshore renewable energy.